Hi Pete, remember me from yesterday? Yeah, I didn’t find the fsuipc.log file, there is no file called fsuipc.log in my fsuipc documents in modules in my flight simulator. Is it possible that I dont have it? It is FSUIPC4.LOG file, not FSUIPC.LOG! And you probably still have Windows hiding file types from you if you didn't turn that off as advised in the FSUIPC documentation, right near the beginning. If so then you will see just "FSUIPC" with no type and something like "Text file" and "Configuration file" in the type column. The text file will be the Log and the config file the INI, with all your settings! BTW It would have been better to have asked this question in your thread, rather than start a new thread just for this. The file is in the sim's Modules folder, alongside FSUIPC4 itself!!! 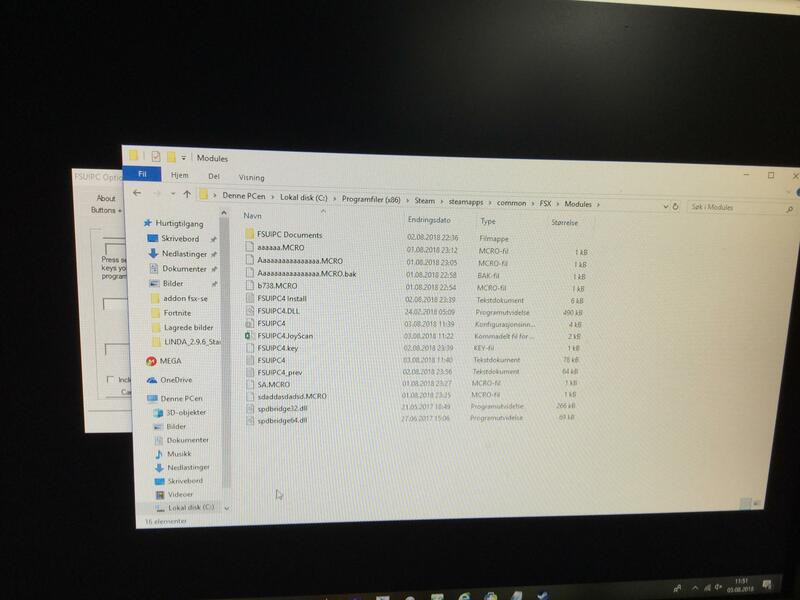 Yup I got it now, I got some help from my dad (works with PCs), what if I send you the file? Ok, I got some help and I found the log file, what now? Reading options from "C:\Program Files (x86)\Steam\steamapps\common\FSX\Modules\FSUIPC4.ini"
62 FLT path = "C:\Users\Philip\Documents\Flight Simulator X - Steam Edition Files\"
171 FS path = "C:\Program Files (x86)\Steam\steamapps\common\FSX\"
671 --- Installed Mouse Macro hooks ok.
144953 Aircraft="Boeing 737-86NNGX Norwegian Air Shuttle Winglets"
1006796 Mouse by function: RX3f000*Xffcc,23 (flags=0090F554), Module="PMDG_737NGX.dll"
1006828 Mouse by function: RX3f000*Xffcc,23 (flags=0090F554), Module="PMDG_737NGX.dll"
1006859 Mouse by function: RX3f000*Xffcc,23 (flags=0090F554), Module="PMDG_737NGX.dll"
1006875 Mouse by function: RX3f000*Xffcc,23 (flags=0090F554), Module="PMDG_737NGX.dll"
1006906 Mouse by function: RX3f000*Xffcc,23 (flags=0090F554), Module="PMDG_737NGX.dll"
1006937 Mouse by function: RX3f000*Xffcc,23 (flags=0090F554), Module="PMDG_737NGX.dll"
1006953 Mouse by function: RX3f000*Xffcc,23 (flags=0090F554), Module="PMDG_737NGX.dll"
1006984 Mouse by function: RX3f000*Xffcc,23 (flags=0090F554), Module="PMDG_737NGX.dll"
1007015 Mouse by function: RX3f000*Xffcc,23 (flags=0090F554), Module="PMDG_737NGX.dll"
1007031 Mouse by function: RX3f000*Xffcc,23 (flags=0090F554), Module="PMDG_737NGX.dll"
1007062 Mouse by function: RX3f000*Xffcc,23 (flags=0090F554), Module="PMDG_737NGX.dll"
1007093 Mouse by function: RX3f000*Xffcc,23 (flags=0090F554), Module="PMDG_737NGX.dll"
1007125 Mouse by function: RX3f000*Xffcc,23 (flags=0090F554), Module="PMDG_737NGX.dll"
1007140 Mouse by function: RX3f000*Xffcc,23 (flags=0090F554), Module="PMDG_737NGX.dll"
1007171 Mouse by function: RX3f000*Xffcc,23 (flags=0090F554), Module="PMDG_737NGX.dll"
1007203 Mouse by function: RX3f000*Xffcc,23 (flags=0090F554), Module="PMDG_737NGX.dll"
1007218 Mouse by function: RX3f000*Xffcc,23 (flags=0090F554), Module="PMDG_737NGX.dll"
1007250 Mouse by function: RX3f000*Xffcc,23 (flags=0090F554), Module="PMDG_737NGX.dll"
1007281 Mouse by function: RX3f000*Xffcc,23 (flags=0090F554), Module="PMDG_737NGX.dll"
1007296 Mouse by function: RX3f000*Xffcc,23 (flags=0090F554), Module="PMDG_737NGX.dll"
1007328 Mouse by function: RX3f000*Xffcc,23 (flags=0090F554), Module="PMDG_737NGX.dll"
1007359 Mouse by function: RX3f000*Xffcc,23 (flags=0090F554), Module="PMDG_737NGX.dll"
1007375 Mouse by function: RX3f000*Xffcc,23 (flags=0090F554), Module="PMDG_737NGX.dll"
1007406 Mouse by function: RX3f000*Xffcc,23 (flags=0090F554), Module="PMDG_737NGX.dll"
1007437 Mouse by function: RX3f000*Xffcc,23 (flags=0090F554), Module="PMDG_737NGX.dll"
1007453 Mouse by function: RX3f000*Xffcc,23 (flags=0090F554), Module="PMDG_737NGX.dll"
1007484 Mouse by function: RX3f000*Xffcc,23 (flags=0090F554), Module="PMDG_737NGX.dll"
1007515 Mouse by function: RX3f000*Xffcc,23 (flags=0090F554), Module="PMDG_737NGX.dll"
1007531 Mouse by function: RX3f000*Xffcc,23 (flags=0090F554), Module="PMDG_737NGX.dll"
1007562 Mouse by function: RX3f000*Xffcc,23 (flags=0090F554), Module="PMDG_737NGX.dll"
1007593 Mouse by function: RX3f000*Xffcc,23 (flags=0090F554), Module="PMDG_737NGX.dll"
1007625 Mouse by function: RX3f000*Xffcc,23 (flags=0090F554), Module="PMDG_737NGX.dll"
1007640 Mouse by function: RX3f000*Xffcc,23 (flags=0090F554), Module="PMDG_737NGX.dll"
1007671 Mouse by function: RX3f000*Xffcc,23 (flags=0090F554), Module="PMDG_737NGX.dll"
1007703 Mouse by function: RX3f000*Xffcc,23 (flags=0090F554), Module="PMDG_737NGX.dll"
1007718 Mouse by function: RX3f000*Xffcc,23 (flags=0090F554), Module="PMDG_737NGX.dll"
1007750 Mouse by function: RX3f000*Xffcc,23 (flags=0090F554), Module="PMDG_737NGX.dll"
1007781 Mouse by function: RX3f000*Xffcc,23 (flags=0090F554), Module="PMDG_737NGX.dll"
1007812 Mouse by function: RX3f000*Xffcc,23 (flags=0090F554), Module="PMDG_737NGX.dll"
1007828 Mouse by function: RX3f000*Xffcc,23 (flags=0090F554), Module="PMDG_737NGX.dll"
1007859 Mouse by function: RX3f000*Xffcc,23 (flags=0090F554), Module="PMDG_737NGX.dll"
1007890 Mouse by function: RX3f000*Xffcc,23 (flags=0090F554), Module="PMDG_737NGX.dll"
1007921 Mouse by function: RX3f000*Xffcc,23 (flags=0090F554), Module="PMDG_737NGX.dll"
1007937 Mouse by function: RX3f000*Xffcc,23 (flags=0090F554), Module="PMDG_737NGX.dll"
1007968 Mouse by function: RX3f000*Xffcc,23 (flags=0090F554), Module="PMDG_737NGX.dll"
1007984 Mouse by function: RX3f000*Xffcc,23 (flags=0090F554), Module="PMDG_737NGX.dll"
1008015 Mouse by function: RX3f000*Xffcc,23 (flags=0090F554), Module="PMDG_737NGX.dll"
1008046 Mouse by function: RX3f000*Xffcc,23 (flags=0090F554), Module="PMDG_737NGX.dll"
1008078 Mouse by function: RX3f000*Xffcc,23 (flags=0090F554), Module="PMDG_737NGX.dll"
1008093 Mouse by function: RX3f000*Xffcc,23 (flags=0090F554), Module="PMDG_737NGX.dll"
1008125 Mouse by function: RX3f000*Xffcc,23 (flags=0090F554), Module="PMDG_737NGX.dll"
1008156 Mouse by function: RX3f000*Xffcc,23 (flags=0090F554), Module="PMDG_737NGX.dll"
1008171 Mouse by function: RX3f000*Xffcc,23 (flags=0090F554), Module="PMDG_737NGX.dll"
1008203 Mouse by function: RX3f000*Xffcc,23 (flags=0090F554), Module="PMDG_737NGX.dll"
1008234 Mouse by function: RX3f000*Xffcc,23 (flags=0090F554), Module="PMDG_737NGX.dll"
1008250 Mouse by function: RX3f000*Xffcc,23 (flags=0090F554), Module="PMDG_737NGX.dll"
1008281 Mouse by function: RX3f000*Xffcc,23 (flags=0090F554), Module="PMDG_737NGX.dll"
1008312 Mouse by function: RX3f000*Xffcc,23 (flags=0090F554), Module="PMDG_737NGX.dll"
1008328 Mouse by function: RX3f000*Xffcc,23 (flags=0090F554), Module="PMDG_737NGX.dll"
1008359 Mouse by function: RX3f000*Xffcc,23 (flags=0090F554), Module="PMDG_737NGX.dll"
1008390 Mouse by function: RX3f000*Xffcc,23 (flags=0090F554), Module="PMDG_737NGX.dll"
1008406 Mouse by function: RX3f000*Xffcc,23 (flags=0090F554), Module="PMDG_737NGX.dll"
1008437 Mouse by function: RX3f000*Xffcc,23 (flags=0090F554), Module="PMDG_737NGX.dll"
1008468 Mouse by function: RX3f000*Xffcc,23 (flags=0090F554), Module="PMDG_737NGX.dll"
1008484 Mouse by function: RX3f000*Xffcc,23 (flags=0090F554), Module="PMDG_737NGX.dll"
1008515 Mouse by function: RX3f000*Xffcc,23 (flags=0090F554), Module="PMDG_737NGX.dll"
1008546 Mouse by function: RX3f000*Xffcc,23 (flags=0090F554), Module="PMDG_737NGX.dll"
1008562 Mouse by function: RX3f000*Xffcc,23 (flags=0090F554), Module="PMDG_737NGX.dll"
1008593 Mouse by function: RX3f000*Xffcc,23 (flags=0090F554), Module="PMDG_737NGX.dll"
1008625 Mouse by function: RX3f000*Xffcc,23 (flags=0090F554), Module="PMDG_737NGX.dll"
1008640 Mouse by function: RX3f000*Xffcc,23 (flags=0090F554), Module="PMDG_737NGX.dll"
1008671 Mouse by function: RX3f000*Xffcc,23 (flags=0090F554), Module="PMDG_737NGX.dll"
1008703 Mouse by function: RX3f000*Xffcc,23 (flags=0090F554), Module="PMDG_737NGX.dll"
1008734 Mouse by function: RX3f000*Xffcc,23 (flags=0090F554), Module="PMDG_737NGX.dll"
1008750 Mouse by function: RX3f000*Xffcc,23 (flags=0090F554), Module="PMDG_737NGX.dll"
1008781 Mouse by function: RX3f000*Xffcc,23 (flags=0090F554), Module="PMDG_737NGX.dll"
1008812 Mouse by function: RX3f000*Xffcc,23 (flags=0090F554), Module="PMDG_737NGX.dll"
1008828 Mouse by function: RX3f000*Xffcc,23 (flags=0090F554), Module="PMDG_737NGX.dll"
1008859 Mouse by function: RX3f000*Xffcc,23 (flags=0090F554), Module="PMDG_737NGX.dll"
1008890 Mouse by function: RX3f000*Xffcc,23 (flags=0090F554), Module="PMDG_737NGX.dll"
1008906 Mouse by function: RX3f000*Xffcc,23 (flags=0090F554), Module="PMDG_737NGX.dll"
1008937 Mouse by function: RX3f000*Xffcc,23 (flags=0090F554), Module="PMDG_737NGX.dll"
1008968 Mouse by function: RX3f000*Xffcc,23 (flags=0090F554), Module="PMDG_737NGX.dll"
1008984 Mouse by function: RX3f000*Xffcc,23 (flags=0090F554), Module="PMDG_737NGX.dll"
1009015 Mouse by function: RX3f000*Xffcc,23 (flags=0090F554), Module="PMDG_737NGX.dll"
1009046 Mouse by function: RX3f000*Xffcc,23 (flags=0090F554), Module="PMDG_737NGX.dll"
1009062 Mouse by function: RX3f000*Xffcc,23 (flags=0090F554), Module="PMDG_737NGX.dll"
1009093 Mouse by function: RX3f000*Xffcc,23 (flags=0090F554), Module="PMDG_737NGX.dll"
1009125 Mouse by function: RX3f000*Xffcc,23 (flags=0090F554), Module="PMDG_737NGX.dll"
1009156 Mouse by function: RX3f000*Xffcc,23 (flags=0090F554), Module="PMDG_737NGX.dll"
1009187 Mouse by function: RX3f000*Xffcc,23 (flags=0090F554), Module="PMDG_737NGX.dll"
1009203 Mouse by function: RX3f000*Xffcc,23 (flags=0090F554), Module="PMDG_737NGX.dll"
1009234 Mouse by function: RX3f000*Xffcc,23 (flags=0090F554), Module="PMDG_737NGX.dll"
1009250 Mouse by function: RX3f000*Xffcc,23 (flags=0090F554), Module="PMDG_737NGX.dll"
1009281 Mouse by function: RX3f000*Xffcc,23 (flags=0090F554), Module="PMDG_737NGX.dll"
1009312 Mouse by function: RX3f000*Xffcc,23 (flags=0090F554), Module="PMDG_737NGX.dll"
1009343 Mouse by function: RX3f000*Xffcc,23 (flags=0090F554), Module="PMDG_737NGX.dll"
1012515 Mouse by function: RXde40*X8bcc,23 (flags=0090F5AC), Module="window.dll"
1012531 Mouse by function: RXde40*X8bcc,23 (flags=0090F5AC), Module="window.dll"
1012562 Mouse by function: RXde40*X8bcc,23 (flags=0090F5AC), Module="window.dll"
1012578 Mouse by function: RXde40*X8bcc,23 (flags=0090F5AC), Module="window.dll"
1012609 Mouse by function: RXde40*X8bcc,23 (flags=0090F5AC), Module="window.dll"
1012625 Mouse by function: RXde40*X8bcc,23 (flags=0090F5AC), Module="window.dll"
1012640 Mouse by function: RXde40*X8bcc,23 (flags=0090F5AC), Module="window.dll"
1012671 Mouse by function: RXde40*X8bcc,23 (flags=0090F5AC), Module="window.dll"
1012687 Mouse by function: RXde40*X8bcc,23 (flags=0090F5AC), Module="window.dll"
1012718 Mouse by function: RXde40*X8bcc,23 (flags=0090F5AC), Module="window.dll"
1012734 Mouse by function: RXde40*X8bcc,23 (flags=0090F5AC), Module="window.dll"
1012765 Mouse by function: RXde40*X8bcc,23 (flags=0090F5AC), Module="window.dll"
1012781 Mouse by function: RXde40*X8bcc,23 (flags=0090F5AC), Module="window.dll"
1012812 Mouse by function: RXde40*X8bcc,23 (flags=0090F5AC), Module="window.dll"
1012828 Mouse by function: RXde40*X8bcc,23 (flags=0090F5AC), Module="window.dll"
1012843 Mouse by function: RXde40*X8bcc,23 (flags=0090F5AC), Module="window.dll"
1012875 Mouse by function: RXde40*X8bcc,23 (flags=0090F5AC), Module="window.dll"
1012890 Mouse by function: RXde40*X8bcc,23 (flags=0090F5AC), Module="window.dll"
1012921 Mouse by function: RXde40*X8bcc,23 (flags=0090F5AC), Module="window.dll"
1012937 Mouse by function: RXde40*X8bcc,23 (flags=0090F5AC), Module="window.dll"
1012968 Mouse by function: RXde40*X8bcc,23 (flags=0090F5AC), Module="window.dll"
1012984 Mouse by function: RXde40*X8bcc,23 (flags=0090F5AC), Module="window.dll"
1013000 Mouse by function: RXde40*X8bcc,23 (flags=0090F5AC), Module="window.dll"
1013031 Mouse by function: RXde40*X8bcc,23 (flags=0090F5AC), Module="window.dll"
1013046 Mouse by function: RXde40*X8bcc,23 (flags=0090F5AC), Module="window.dll"
1013078 Mouse by function: RXde40*X8bcc,23 (flags=0090F5AC), Module="window.dll"
1013093 Mouse by function: RXde40*X8bcc,23 (flags=0090F5AC), Module="window.dll"
1013125 Mouse by function: RXde40*X8bcc,23 (flags=0090F5AC), Module="window.dll"
1013140 Mouse by function: RXde40*X8bcc,23 (flags=0090F5AC), Module="window.dll"
1013156 Mouse by function: RXde40*X8bcc,23 (flags=0090F5AC), Module="window.dll"
1013187 Mouse by function: RXde40*X8bcc,23 (flags=0090F5AC), Module="window.dll"
1013203 Mouse by function: RXde40*X8bcc,23 (flags=0090F5AC), Module="window.dll"
1013234 Mouse by function: RXde40*X8bcc,23 (flags=0090F5AC), Module="window.dll"
1013250 Mouse by function: RXde40*X8bcc,23 (flags=0090F5AC), Module="window.dll"
1013281 Mouse by function: RXde40*X8bcc,23 (flags=0090F5AC), Module="window.dll"
1013296 Mouse by function: RXde40*X8bcc,23 (flags=0090F5AC), Module="window.dll"
1013312 Mouse by function: RXde40*X8bcc,23 (flags=0090F5AC), Module="window.dll"
1013343 Mouse by function: RXde40*X8bcc,23 (flags=0090F5AC), Module="window.dll"
1013359 Mouse by function: RXde40*X8bcc,23 (flags=0090F5AC), Module="window.dll"
1013390 Mouse by function: RXde40*X8bcc,23 (flags=0090F5AC), Module="window.dll"
1013406 Mouse by function: RXde40*X8bcc,23 (flags=0090F5AC), Module="window.dll"
1013437 Mouse by function: RXde40*X8bcc,23 (flags=0090F5AC), Module="window.dll"
1013453 Mouse by function: RXde40*X8bcc,23 (flags=0090F5AC), Module="window.dll"
1013468 Mouse by function: RXde40*X8bcc,23 (flags=0090F5AC), Module="window.dll"
1013500 Mouse by function: RXde40*X8bcc,23 (flags=0090F5AC), Module="window.dll"
1013515 Mouse by function: RXde40*X8bcc,23 (flags=0090F5AC), Module="window.dll"
1013546 Mouse by function: RXde40*X8bcc,23 (flags=0090F5AC), Module="window.dll"
1013562 Mouse by function: RXde40*X8bcc,23 (flags=0090F5AC), Module="window.dll"
1013578 Mouse by function: RXde40*X8bcc,23 (flags=0090F5AC), Module="window.dll"
1013609 Mouse by function: RXde40*X8bcc,23 (flags=0090F5AC), Module="window.dll"
1013625 Mouse by function: RXde40*X8bcc,23 (flags=0090F5AC), Module="window.dll"
1013656 Mouse by function: RXde40*X8bcc,23 (flags=0090F5AC), Module="window.dll"
1016031 Mouse by function: RX3eeb0*Xffcc,23 (flags=0090F554), Module="PMDG_737NGX.dll"
1016265 Mouse by function: RXde40*X8bcc,23 (flags=0090F5AC), Module="window.dll"
1016546 Mouse by function: RXde40*X8bcc,23 (flags=0090F5AC), Module="window.dll"
1016578 Mouse by function: RXde40*X8bcc,23 (flags=0090F5AC), Module="window.dll"
1016593 Mouse by function: RXde40*X8bcc,23 (flags=0090F5AC), Module="window.dll"
1016625 Mouse by function: RXde40*X8bcc,23 (flags=0090F5AC), Module="window.dll"
1016640 Mouse by function: RXde40*X8bcc,23 (flags=0090F5AC), Module="window.dll"
1016656 Mouse by function: RXde40*X8bcc,23 (flags=0090F5AC), Module="window.dll"
1016687 Mouse by function: RXde40*X8bcc,23 (flags=0090F5AC), Module="window.dll"
1016703 Mouse by function: RXde40*X8bcc,23 (flags=0090F5AC), Module="window.dll"
1016734 Mouse by function: RXde40*X8bcc,23 (flags=0090F5AC), Module="window.dll"
1016750 Mouse by function: RXde40*X8bcc,23 (flags=0090F5AC), Module="window.dll"
1016781 Mouse by function: RXde40*X8bcc,23 (flags=0090F5AC), Module="window.dll"
1016796 Mouse by function: RXde40*X8bcc,23 (flags=0090F5AC), Module="window.dll"
1016828 Mouse by function: RXde40*X8bcc,23 (flags=0090F5AC), Module="window.dll"
1016843 Mouse by function: RXde40*X8bcc,23 (flags=0090F5AC), Module="window.dll"
1016859 Mouse by function: RXde40*X8bcc,23 (flags=0090F5AC), Module="window.dll"
1016890 Mouse by function: RXde40*X8bcc,23 (flags=0090F5AC), Module="window.dll"
1016906 Mouse by function: RXde40*X8bcc,23 (flags=0090F5AC), Module="window.dll"
1016937 Mouse by function: RXde40*X8bcc,23 (flags=0090F5AC), Module="window.dll"
1016968 Mouse by function: RXde40*X8bcc,23 (flags=0090F5AC), Module="window.dll"
1016984 Mouse by function: RXde40*X8bcc,23 (flags=0090F5AC), Module="window.dll"
1017015 Mouse by function: RXde40*X8bcc,23 (flags=0090F5AC), Module="window.dll"
1017031 Mouse by function: RXde40*X8bcc,23 (flags=0090F5AC), Module="window.dll"
1017046 Mouse by function: RXde40*X8bcc,23 (flags=0090F5AC), Module="window.dll"
1017078 Mouse by function: RXde40*X8bcc,23 (flags=0090F5AC), Module="window.dll"
1017093 Mouse by function: RXde40*X8bcc,23 (flags=0090F5AC), Module="window.dll"
1017125 Mouse by function: RXde40*X8bcc,23 (flags=0090F5AC), Module="window.dll"
1017140 Mouse by function: RXde40*X8bcc,23 (flags=0090F5AC), Module="window.dll"
1017156 Mouse by function: RXde40*X8bcc,23 (flags=0090F5AC), Module="window.dll"
1017187 Mouse by function: RXde40*X8bcc,23 (flags=0090F5AC), Module="window.dll"
1017203 Mouse by function: RXde40*X8bcc,23 (flags=0090F5AC), Module="window.dll"
1017234 Mouse by function: RXde40*X8bcc,23 (flags=0090F5AC), Module="window.dll"
1017250 Mouse by function: RXde40*X8bcc,23 (flags=0090F5AC), Module="window.dll"
1017281 Mouse by function: RXde40*X8bcc,23 (flags=0090F5AC), Module="window.dll"
1017296 Mouse by function: RXde40*X8bcc,23 (flags=0090F5AC), Module="window.dll"
1017328 Mouse by function: RXde40*X8bcc,23 (flags=0090F5AC), Module="window.dll"
1017343 Mouse by function: RXde40*X8bcc,23 (flags=0090F5AC), Module="window.dll"
1017359 Mouse by function: RXde40*X8bcc,23 (flags=0090F5AC), Module="window.dll"
1017390 Mouse by function: RXde40*X8bcc,23 (flags=0090F5AC), Module="window.dll"
1017406 Mouse by function: RXde40*X8bcc,23 (flags=0090F5AC), Module="window.dll"
1017437 Mouse by function: RXde40*X8bcc,23 (flags=0090F5AC), Module="window.dll"
1017453 Mouse by function: RXde40*X8bcc,23 (flags=0090F5AC), Module="window.dll"
1017484 Mouse by function: RXde40*X8bcc,23 (flags=0090F5AC), Module="window.dll"
1017500 Mouse by function: RXde40*X8bcc,23 (flags=0090F5AC), Module="window.dll"
1017515 Mouse by function: RXde40*X8bcc,23 (flags=0090F5AC), Module="window.dll"
1017546 Mouse by function: RXde40*X8bcc,23 (flags=0090F5AC), Module="window.dll"
1017562 Mouse by function: RXde40*X8bcc,23 (flags=0090F5AC), Module="window.dll"
1017593 Mouse by function: RXde40*X8bcc,23 (flags=0090F5AC), Module="window.dll"
1017609 Mouse by function: RXde40*X8bcc,23 (flags=0090F5AC), Module="window.dll"
1017640 Mouse by function: RXde40*X8bcc,23 (flags=0090F5AC), Module="window.dll"
1017656 Mouse by function: RXde40*X8bcc,23 (flags=0090F5AC), Module="window.dll"
1017671 Mouse by function: RXde40*X8bcc,23 (flags=0090F5AC), Module="window.dll"
1017703 Mouse by function: RXde40*X8bcc,23 (flags=0090F5AC), Module="window.dll"
1017718 Mouse by function: RXde40*X8bcc,23 (flags=0090F5AC), Module="window.dll"
1017750 Mouse by function: RXde40*X8bcc,23 (flags=0090F5AC), Module="window.dll"
1017765 Mouse by function: RXde40*X8bcc,23 (flags=0090F5AC), Module="window.dll"
1017796 Mouse by function: RXde40*X8bcc,23 (flags=0090F5AC), Module="window.dll"
1017812 Mouse by function: RXde40*X8bcc,23 (flags=0090F5AC), Module="window.dll"
1017843 Mouse by function: RXde40*X8bcc,23 (flags=0090F5AC), Module="window.dll"
1017859 Mouse by function: RXde40*X8bcc,23 (flags=0090F5AC), Module="window.dll"
1017890 Mouse by function: RXde40*X8bcc,23 (flags=0090F5AC), Module="window.dll"
1017906 Mouse by function: RXde40*X8bcc,23 (flags=0090F5AC), Module="window.dll"
1017921 Mouse by function: RXde40*X8bcc,23 (flags=0090F5AC), Module="window.dll"
1017953 Mouse by function: RXde40*X8bcc,23 (flags=0090F5AC), Module="window.dll"
1017968 Mouse by function: RXde40*X8bcc,23 (flags=0090F5AC), Module="window.dll"
1018000 Mouse by function: RXde40*X8bcc,23 (flags=0090F5AC), Module="window.dll"
1018015 Mouse by function: RXde40*X8bcc,23 (flags=0090F5AC), Module="window.dll"
1018031 Mouse by function: RXde40*X8bcc,23 (flags=0090F5AC), Module="window.dll"
1018062 Mouse by function: RXde40*X8bcc,23 (flags=0090F5AC), Module="window.dll"
1018078 Mouse by function: RXde40*X8bcc,23 (flags=0090F5AC), Module="window.dll"
1018109 Mouse by function: RXde40*X8bcc,23 (flags=0090F5AC), Module="window.dll"
1018125 Mouse by function: RXde40*X8bcc,23 (flags=0090F5AC), Module="window.dll"
1018156 Mouse by function: RXde40*X8bcc,23 (flags=0090F5AC), Module="window.dll"
1018171 Mouse by function: RXde40*X8bcc,23 (flags=0090F5AC), Module="window.dll"
1018187 Mouse by function: RXde40*X8bcc,23 (flags=0090F5AC), Module="window.dll"
1018218 Mouse by function: RXde40*X8bcc,23 (flags=0090F5AC), Module="window.dll"
1018234 Mouse by function: RXde40*X8bcc,23 (flags=0090F5AC), Module="window.dll"
1018265 Mouse by function: RXde40*X8bcc,23 (flags=0090F5AC), Module="window.dll"
1018281 Mouse by function: RXde40*X8bcc,23 (flags=0090F5AC), Module="window.dll"
1018312 Mouse by function: RXde40*X8bcc,23 (flags=0090F5AC), Module="window.dll"
1018328 Mouse by function: RXde40*X8bcc,23 (flags=0090F5AC), Module="window.dll"
1018359 Mouse by function: RXde40*X8bcc,23 (flags=0090F5AC), Module="window.dll"
1018937 Mouse by function: RXde40*X8bcc,23 (flags=0090F5AC), Module="window.dll"
1018953 Mouse by function: RXde40*X8bcc,23 (flags=0090F5AC), Module="window.dll"
1018984 Mouse by function: RXde40*X8bcc,23 (flags=0090F5AC), Module="window.dll"
1019000 Mouse by function: RXde40*X8bcc,23 (flags=0090F5AC), Module="window.dll"
1019015 Mouse by function: RXde40*X8bcc,23 (flags=0090F5AC), Module="window.dll"
1019046 Mouse by function: RXde40*X8bcc,23 (flags=0090F5AC), Module="window.dll"
1019062 Mouse by function: RXde40*X8bcc,23 (flags=0090F5AC), Module="window.dll"
1019093 Mouse by function: RXde40*X8bcc,23 (flags=0090F5AC), Module="window.dll"
1019109 Mouse by function: RXde40*X8bcc,23 (flags=0090F5AC), Module="window.dll"
1019140 Mouse by function: RXde40*X8bcc,23 (flags=0090F5AC), Module="window.dll"
1019156 Mouse by function: RXde40*X8bcc,23 (flags=0090F5AC), Module="window.dll"
1019187 Mouse by function: RXde40*X8bcc,23 (flags=0090F5AC), Module="window.dll"
1019203 Mouse by function: RXde40*X8bcc,23 (flags=0090F5AC), Module="window.dll"
1019218 Mouse by function: RXde40*X8bcc,23 (flags=0090F5AC), Module="window.dll"
1019250 Mouse by function: RXde40*X8bcc,23 (flags=0090F5AC), Module="window.dll"
1019265 Mouse by function: RXde40*X8bcc,23 (flags=0090F5AC), Module="window.dll"
1019296 Mouse by function: RXde40*X8bcc,23 (flags=0090F5AC), Module="window.dll"
1019312 Mouse by function: RXde40*X8bcc,23 (flags=0090F5AC), Module="window.dll"
1019343 Mouse by function: RXde40*X8bcc,23 (flags=0090F5AC), Module="window.dll"
1019359 Mouse by function: RXde40*X8bcc,23 (flags=0090F5AC), Module="window.dll"
1019375 Mouse by function: RXde40*X8bcc,23 (flags=0090F5AC), Module="window.dll"
1019406 Mouse by function: RXde40*X8bcc,23 (flags=0090F5AC), Module="window.dll"
1019421 Mouse by function: RXde40*X8bcc,23 (flags=0090F5AC), Module="window.dll"
1019453 Mouse by function: RXde40*X8bcc,23 (flags=0090F5AC), Module="window.dll"
1019468 Mouse by function: RXde40*X8bcc,23 (flags=0090F5AC), Module="window.dll"
1019500 Mouse by function: RXde40*X8bcc,23 (flags=0090F5AC), Module="window.dll"
1019515 Mouse by function: RXde40*X8bcc,23 (flags=0090F5AC), Module="window.dll"
1019546 Mouse by function: RXde40*X8bcc,23 (flags=0090F5AC), Module="window.dll"
1019640 Mouse by function: RXde40*X8bcc,23 (flags=0090F5AC), Module="window.dll"
1019671 Mouse by function: RXde40*X8bcc,23 (flags=0090F5AC), Module="window.dll"
1019687 Mouse by function: RXde40*X8bcc,23 (flags=0090F5AC), Module="window.dll"
1019718 Mouse by function: RXde40*X8bcc,23 (flags=0090F5AC), Module="window.dll"
1019734 Mouse by function: RXde40*X8bcc,23 (flags=0090F5AC), Module="window.dll"
1019765 Mouse by function: RXde40*X8bcc,23 (flags=0090F5AC), Module="window.dll"
1019781 Mouse by function: RXde40*X8bcc,23 (flags=0090F5AC), Module="window.dll"
1019812 Mouse by function: RXde40*X8bcc,23 (flags=0090F5AC), Module="window.dll"
1019828 Mouse by function: RXde40*X8bcc,23 (flags=0090F5AC), Module="window.dll"
1019859 Mouse by function: RXde40*X8bcc,23 (flags=0090F5AC), Module="window.dll"
1019875 Mouse by function: RXde40*X8bcc,23 (flags=0090F5AC), Module="window.dll"
1019906 Mouse by function: RXde40*X8bcc,23 (flags=0090F5AC), Module="window.dll"
1019921 Mouse by function: RXde40*X8bcc,23 (flags=0090F5AC), Module="window.dll"
1019953 Mouse by function: RXde40*X8bcc,23 (flags=0090F5AC), Module="window.dll"
1020000 Mouse by function: RXde40*X8bcc,23 (flags=0090F5AC), Module="window.dll"
1020343 Mouse by function: RXde40*X8bcc,23 (flags=0090F5AC), Module="window.dll"
1020359 Mouse by function: RXde40*X8bcc,23 (flags=0090F5AC), Module="window.dll"
1020390 Mouse by function: RX3d320*Xffcc,23 (flags=0090F554), Module="PMDG_737NGX.dll"
1020406 Mouse by function: RX3d320*Xffcc,23 (flags=0090F554), Module="PMDG_737NGX.dll"
1020437 Mouse by function: RX3d320*Xffcc,23 (flags=0090F554), Module="PMDG_737NGX.dll"
1020468 Mouse by function: RX3d320*Xffcc,23 (flags=0090F554), Module="PMDG_737NGX.dll"
1020500 Mouse by function: RX3d320*Xffcc,23 (flags=0090F554), Module="PMDG_737NGX.dll"
1020640 Mouse by function: RX3d320*Xffcc,23 (flags=0090F554), Module="PMDG_737NGX.dll"
1020671 Mouse by function: RX3d320*Xffcc,23 (flags=0090F554), Module="PMDG_737NGX.dll"
1020687 Mouse by function: RX3d320*Xffcc,23 (flags=0090F554), Module="PMDG_737NGX.dll"
1020734 Mouse by function: RX3d320*Xffcc,23 (flags=0090F554), Module="PMDG_737NGX.dll"
1020765 Mouse by function: RX3d320*Xffcc,23 (flags=0090F554), Module="PMDG_737NGX.dll"
1020796 Mouse by function: RX3d320*Xffcc,23 (flags=0090F554), Module="PMDG_737NGX.dll"
1020828 Mouse by function: RX3d320*Xffcc,23 (flags=0090F554), Module="PMDG_737NGX.dll"
1020859 Mouse by function: RX3d320*Xffcc,23 (flags=0090F554), Module="PMDG_737NGX.dll"
1020906 Mouse by function: RX3d320*Xffcc,23 (flags=0090F554), Module="PMDG_737NGX.dll"
1020937 Mouse by function: RX3d320*Xffcc,23 (flags=0090F554), Module="PMDG_737NGX.dll"
1020968 Mouse by function: RX3d320*Xffcc,23 (flags=0090F554), Module="PMDG_737NGX.dll"
1020984 Mouse by function: RX3d320*Xffcc,23 (flags=0090F554), Module="PMDG_737NGX.dll"
1021015 Mouse by function: RX3d320*Xffcc,23 (flags=0090F554), Module="PMDG_737NGX.dll"
1021046 Mouse by function: RX3d320*Xffcc,23 (flags=0090F554), Module="PMDG_737NGX.dll"
1021078 Mouse by function: RX3d320*Xffcc,23 (flags=0090F554), Module="PMDG_737NGX.dll"
1021093 Mouse by function: RX3d320*Xffcc,23 (flags=0090F554), Module="PMDG_737NGX.dll"
1021125 Mouse by function: RX3d320*Xffcc,23 (flags=0090F554), Module="PMDG_737NGX.dll"
1021156 Mouse by function: RX3d320*Xffcc,23 (flags=0090F554), Module="PMDG_737NGX.dll"
1021187 Mouse by function: RX3d320*Xffcc,23 (flags=0090F554), Module="PMDG_737NGX.dll"
1021203 Mouse by function: RX3d320*Xffcc,23 (flags=0090F554), Module="PMDG_737NGX.dll"
1021234 Mouse by function: RX3d320*Xffcc,23 (flags=0090F554), Module="PMDG_737NGX.dll"
1021265 Mouse by function: RX3d320*Xffcc,23 (flags=0090F554), Module="PMDG_737NGX.dll"
1021296 Mouse by function: RX3d320*Xffcc,23 (flags=0090F554), Module="PMDG_737NGX.dll"
1021312 Mouse by function: RX3d320*Xffcc,23 (flags=0090F554), Module="PMDG_737NGX.dll"
1021343 Mouse by function: RX3d320*Xffcc,23 (flags=0090F554), Module="PMDG_737NGX.dll"
1021375 Mouse by function: RX3d320*Xffcc,23 (flags=0090F554), Module="PMDG_737NGX.dll"
1021406 Mouse by function: RX3d320*Xffcc,23 (flags=0090F554), Module="PMDG_737NGX.dll"
1021421 Mouse by function: RX3d320*Xffcc,23 (flags=0090F554), Module="PMDG_737NGX.dll"
1021453 Mouse by function: RX3d320*Xffcc,23 (flags=0090F554), Module="PMDG_737NGX.dll"
1021484 Mouse by function: RX3d320*Xffcc,23 (flags=0090F554), Module="PMDG_737NGX.dll"
1021515 Mouse by function: RX3d320*Xffcc,23 (flags=0090F554), Module="PMDG_737NGX.dll"
1021531 Mouse by function: RX3d320*Xffcc,23 (flags=0090F554), Module="PMDG_737NGX.dll"
1021562 Mouse by function: RX3d320*Xffcc,23 (flags=0090F554), Module="PMDG_737NGX.dll"
1021593 Mouse by function: RX3d320*Xffcc,23 (flags=0090F554), Module="PMDG_737NGX.dll"
1021625 Mouse by function: RX3d320*Xffcc,23 (flags=0090F554), Module="PMDG_737NGX.dll"
1021656 Mouse by function: RX3d320*Xffcc,23 (flags=0090F554), Module="PMDG_737NGX.dll"
1021671 Mouse by function: RX3d320*Xffcc,23 (flags=0090F554), Module="PMDG_737NGX.dll"
1021703 Mouse by function: RX3d320*Xffcc,23 (flags=0090F554), Module="PMDG_737NGX.dll"
1021734 Mouse by function: RX3d320*Xffcc,23 (flags=0090F554), Module="PMDG_737NGX.dll"
1021750 Mouse by function: RX3d320*Xffcc,23 (flags=0090F554), Module="PMDG_737NGX.dll"
1021781 Mouse by function: RX3d320*Xffcc,23 (flags=0090F554), Module="PMDG_737NGX.dll"
1021812 Mouse by function: RX3d320*Xffcc,23 (flags=0090F554), Module="PMDG_737NGX.dll"
1021843 Mouse by function: RX3d320*Xffcc,23 (flags=0090F554), Module="PMDG_737NGX.dll"
1021859 Mouse by function: RX3d320*Xffcc,23 (flags=0090F554), Module="PMDG_737NGX.dll"
1021890 Mouse by function: RX3d320*Xffcc,23 (flags=0090F554), Module="PMDG_737NGX.dll"
1021921 Mouse by function: RX3d320*Xffcc,23 (flags=0090F554), Module="PMDG_737NGX.dll"
1021953 Mouse by function: RX3d320*Xffcc,23 (flags=0090F554), Module="PMDG_737NGX.dll"
1021984 Mouse by function: RX3d320*Xffcc,23 (flags=0090F554), Module="PMDG_737NGX.dll"
1022000 Mouse by function: RX3d320*Xffcc,23 (flags=0090F554), Module="PMDG_737NGX.dll"
1022031 Mouse by function: RX3d320*Xffcc,23 (flags=0090F554), Module="PMDG_737NGX.dll"
1022062 Mouse by function: RX3d320*Xffcc,23 (flags=0090F554), Module="PMDG_737NGX.dll"
1022078 Mouse by function: RX3d320*Xffcc,23 (flags=0090F554), Module="PMDG_737NGX.dll"
1022109 Mouse by function: RX3d320*Xffcc,23 (flags=0090F554), Module="PMDG_737NGX.dll"
1022140 Mouse by function: RX3d320*Xffcc,23 (flags=0090F554), Module="PMDG_737NGX.dll"
1022171 Mouse by function: RX3d320*Xffcc,23 (flags=0090F554), Module="PMDG_737NGX.dll"
1022187 Mouse by function: RX3d320*Xffcc,23 (flags=0090F554), Module="PMDG_737NGX.dll"
1022218 Mouse by function: RX3d320*Xffcc,23 (flags=0090F554), Module="PMDG_737NGX.dll"
1022250 Mouse by function: RX3d320*Xffcc,23 (flags=0090F554), Module="PMDG_737NGX.dll"
1022281 Mouse by function: RX3d320*Xffcc,23 (flags=0090F554), Module="PMDG_737NGX.dll"
1022296 Mouse by function: RX3d320*Xffcc,23 (flags=0090F554), Module="PMDG_737NGX.dll"
1022328 Mouse by function: RX3d320*Xffcc,23 (flags=0090F554), Module="PMDG_737NGX.dll"
1022359 Mouse by function: RX3d320*Xffcc,23 (flags=0090F554), Module="PMDG_737NGX.dll"
1022390 Mouse by function: RX3d320*Xffcc,23 (flags=0090F554), Module="PMDG_737NGX.dll"
1022406 Mouse by function: RX3d320*Xffcc,23 (flags=0090F554), Module="PMDG_737NGX.dll"
1022437 Mouse by function: RX3d320*Xffcc,23 (flags=0090F554), Module="PMDG_737NGX.dll"
1022468 Mouse by function: RX3d320*Xffcc,23 (flags=0090F554), Module="PMDG_737NGX.dll"
1022500 Mouse by function: RX3d320*Xffcc,23 (flags=0090F554), Module="PMDG_737NGX.dll"
1022515 Mouse by function: RX3d320*Xffcc,23 (flags=0090F554), Module="PMDG_737NGX.dll"
1022546 Mouse by function: RX3d320*Xffcc,23 (flags=0090F554), Module="PMDG_737NGX.dll"
1022578 Mouse by function: RX3d320*Xffcc,23 (flags=0090F554), Module="PMDG_737NGX.dll"
1022609 Mouse by function: RX3d320*Xffcc,23 (flags=0090F554), Module="PMDG_737NGX.dll"
1022625 Mouse by function: RX3d320*Xffcc,23 (flags=0090F554), Module="PMDG_737NGX.dll"
1022656 Mouse by function: RX3d320*Xffcc,23 (flags=0090F554), Module="PMDG_737NGX.dll"
1022687 Mouse by function: RX3d320*Xffcc,23 (flags=0090F554), Module="PMDG_737NGX.dll"
1022718 Mouse by function: RX3d320*Xffcc,23 (flags=0090F554), Module="PMDG_737NGX.dll"
1022734 Mouse by function: RX3d320*Xffcc,23 (flags=0090F554), Module="PMDG_737NGX.dll"
1022765 Mouse by function: RX3d320*Xffcc,23 (flags=0090F554), Module="PMDG_737NGX.dll"
1022796 Mouse by function: RX3d320*Xffcc,23 (flags=0090F554), Module="PMDG_737NGX.dll"
1022828 Mouse by function: RX3d320*Xffcc,23 (flags=0090F554), Module="PMDG_737NGX.dll"
1022859 Mouse by function: RX3d320*Xffcc,23 (flags=0090F554), Module="PMDG_737NGX.dll"
1022890 Mouse by function: RX3d320*Xffcc,23 (flags=0090F554), Module="PMDG_737NGX.dll"
1022921 Mouse by function: RX3d320*Xffcc,23 (flags=0090F554), Module="PMDG_737NGX.dll"
1022937 Mouse by function: RX3d320*Xffcc,23 (flags=0090F554), Module="PMDG_737NGX.dll"
1022968 Mouse by function: RX3d320*Xffcc,23 (flags=0090F554), Module="PMDG_737NGX.dll"
1023000 Mouse by function: RX3d320*Xffcc,23 (flags=0090F554), Module="PMDG_737NGX.dll"
1023031 Mouse by function: RX3d320*Xffcc,23 (flags=0090F554), Module="PMDG_737NGX.dll"
1023046 Mouse by function: RX3d320*Xffcc,23 (flags=0090F554), Module="PMDG_737NGX.dll"
1023078 Mouse by function: RX3d320*Xffcc,23 (flags=0090F554), Module="PMDG_737NGX.dll"
1023109 Mouse by function: RX3d320*Xffcc,23 (flags=0090F554), Module="PMDG_737NGX.dll"
1023140 Mouse by function: RX3d320*Xffcc,23 (flags=0090F554), Module="PMDG_737NGX.dll"
1023156 Mouse by function: RX3d320*Xffcc,23 (flags=0090F554), Module="PMDG_737NGX.dll"
1023187 Mouse by function: RX3d320*Xffcc,23 (flags=0090F554), Module="PMDG_737NGX.dll"
1023218 Mouse by function: RX3d320*Xffcc,23 (flags=0090F554), Module="PMDG_737NGX.dll"
1023250 Mouse by function: RX3d320*Xffcc,23 (flags=0090F554), Module="PMDG_737NGX.dll"
1023265 Mouse by function: RX3d320*Xffcc,23 (flags=0090F554), Module="PMDG_737NGX.dll"
1023296 Mouse by function: RX3d320*Xffcc,23 (flags=0090F554), Module="PMDG_737NGX.dll"
1023328 Mouse by function: RX3d320*Xffcc,23 (flags=0090F554), Module="PMDG_737NGX.dll"
1023343 Mouse by function: RX3d320*Xffcc,23 (flags=0090F554), Module="PMDG_737NGX.dll"
1023359 Mouse by function: RX3d320*Xffcc,23 (flags=0090F554), Module="PMDG_737NGX.dll"
1023375 Mouse by function: RX3d320*Xffcc,23 (flags=0090F554), Module="PMDG_737NGX.dll"
1023406 Mouse by function: RX3d320*Xffcc,23 (flags=0090F554), Module="PMDG_737NGX.dll"
1023437 Mouse by function: RX3d320*Xffcc,23 (flags=0090F554), Module="PMDG_737NGX.dll"
1023468 Mouse by function: RX3d320*Xffcc,23 (flags=0090F554), Module="PMDG_737NGX.dll"
1023484 Mouse by function: RX3d320*Xffcc,23 (flags=0090F554), Module="PMDG_737NGX.dll"
1023515 Mouse by function: RX3d320*Xffcc,23 (flags=0090F554), Module="PMDG_737NGX.dll"
1023546 Mouse by function: RX3d320*Xffcc,23 (flags=0090F554), Module="PMDG_737NGX.dll"
1023578 Mouse by function: RX3d320*Xffcc,23 (flags=0090F554), Module="PMDG_737NGX.dll"
1023593 Mouse by function: RX3d320*Xffcc,23 (flags=0090F554), Module="PMDG_737NGX.dll"
1023625 Mouse by function: RX3d320*Xffcc,23 (flags=0090F554), Module="PMDG_737NGX.dll"
1023656 Mouse by function: RX3d320*Xffcc,23 (flags=0090F554), Module="PMDG_737NGX.dll"
1023671 Mouse by function: RX3d320*Xffcc,23 (flags=0090F554), Module="PMDG_737NGX.dll"
1023703 Mouse by function: RX3d320*Xffcc,23 (flags=0090F554), Module="PMDG_737NGX.dll"
1023734 Mouse by function: RX3d320*Xffcc,23 (flags=0090F554), Module="PMDG_737NGX.dll"
1023765 Mouse by function: RX3d320*Xffcc,23 (flags=0090F554), Module="PMDG_737NGX.dll"
1023781 Mouse by function: RX3d320*Xffcc,23 (flags=0090F554), Module="PMDG_737NGX.dll"
1023812 Mouse by function: RX3d320*Xffcc,23 (flags=0090F554), Module="PMDG_737NGX.dll"
1023843 Mouse by function: RX3d320*Xffcc,23 (flags=0090F554), Module="PMDG_737NGX.dll"
1023875 Mouse by function: RX3d320*Xffcc,23 (flags=0090F554), Module="PMDG_737NGX.dll"
1023890 Mouse by function: RX3d320*Xffcc,23 (flags=0090F554), Module="PMDG_737NGX.dll"
1023921 Mouse by function: RX3d320*Xffcc,23 (flags=0090F554), Module="PMDG_737NGX.dll"
1023953 Mouse by function: RX3d320*Xffcc,23 (flags=0090F554), Module="PMDG_737NGX.dll"
1023984 Mouse by function: RX3d320*Xffcc,23 (flags=0090F554), Module="PMDG_737NGX.dll"
1024015 Mouse by function: RX3d320*Xffcc,23 (flags=0090F554), Module="PMDG_737NGX.dll"
1024031 Mouse by function: RX3d320*Xffcc,23 (flags=0090F554), Module="PMDG_737NGX.dll"
1024062 Mouse by function: RX3d320*Xffcc,23 (flags=0090F554), Module="PMDG_737NGX.dll"
1024093 Mouse by function: RX3d320*Xffcc,23 (flags=0090F554), Module="PMDG_737NGX.dll"
1024125 Mouse by function: RX3d320*Xffcc,23 (flags=0090F554), Module="PMDG_737NGX.dll"
1024140 Mouse by function: RX3d320*Xffcc,23 (flags=0090F554), Module="PMDG_737NGX.dll"
1024171 Mouse by function: RX3d320*Xffcc,23 (flags=0090F554), Module="PMDG_737NGX.dll"
1024203 Mouse by function: RX3d320*Xffcc,23 (flags=0090F554), Module="PMDG_737NGX.dll"
1024234 Mouse by function: RX3d320*Xffcc,23 (flags=0090F554), Module="PMDG_737NGX.dll"
1024265 Mouse by function: RX3d320*Xffcc,23 (flags=0090F554), Module="PMDG_737NGX.dll"
1024296 Mouse by function: RX3d320*Xffcc,23 (flags=0090F554), Module="PMDG_737NGX.dll"
1024609 Mouse by function: RX3d390*Xffcc,23 (flags=0090F554), Module="PMDG_737NGX.dll"
1024640 Mouse by function: RX3d390*Xffcc,23 (flags=0090F554), Module="PMDG_737NGX.dll"
1024671 Mouse by function: RX3d390*Xffcc,23 (flags=0090F554), Module="PMDG_737NGX.dll"
1024687 Mouse by function: RX3d390*Xffcc,23 (flags=0090F554), Module="PMDG_737NGX.dll"
1024718 Mouse by function: RX3d390*Xffcc,23 (flags=0090F554), Module="PMDG_737NGX.dll"
1024750 Mouse by function: RX3d390*Xffcc,23 (flags=0090F554), Module="PMDG_737NGX.dll"
1024781 Mouse by function: RX3d390*Xffcc,23 (flags=0090F554), Module="PMDG_737NGX.dll"
1024796 Mouse by function: RX3d390*Xffcc,23 (flags=0090F554), Module="PMDG_737NGX.dll"
1024828 Mouse by function: RX3d390*Xffcc,23 (flags=0090F554), Module="PMDG_737NGX.dll"
1024859 Mouse by function: RX3d390*Xffcc,23 (flags=0090F554), Module="PMDG_737NGX.dll"
1024890 Mouse by function: RX3d390*Xffcc,23 (flags=0090F554), Module="PMDG_737NGX.dll"
1024921 Mouse by function: RX3d390*Xffcc,23 (flags=0090F554), Module="PMDG_737NGX.dll"
1024937 Mouse by function: RX3d390*Xffcc,23 (flags=0090F554), Module="PMDG_737NGX.dll"
1024968 Mouse by function: RX3d390*Xffcc,23 (flags=0090F554), Module="PMDG_737NGX.dll"
1025000 Mouse by function: RX3d390*Xffcc,23 (flags=0090F554), Module="PMDG_737NGX.dll"
1025015 Mouse by function: RX3d390*Xffcc,23 (flags=0090F554), Module="PMDG_737NGX.dll"
1025046 Mouse by function: RX3d390*Xffcc,23 (flags=0090F554), Module="PMDG_737NGX.dll"
1025078 Mouse by function: RX3d390*Xffcc,23 (flags=0090F554), Module="PMDG_737NGX.dll"
1025109 Mouse by function: RX3d390*Xffcc,23 (flags=0090F554), Module="PMDG_737NGX.dll"
1025125 Mouse by function: RX3d390*Xffcc,23 (flags=0090F554), Module="PMDG_737NGX.dll"
1025156 Mouse by function: RX3d390*Xffcc,23 (flags=0090F554), Module="PMDG_737NGX.dll"
1025187 Mouse by function: RX3d390*Xffcc,23 (flags=0090F554), Module="PMDG_737NGX.dll"
1025218 Mouse by function: RX3d390*Xffcc,23 (flags=0090F554), Module="PMDG_737NGX.dll"
1025234 Mouse by function: RX3d390*Xffcc,23 (flags=0090F554), Module="PMDG_737NGX.dll"
1025265 Mouse by function: RX3d390*Xffcc,23 (flags=0090F554), Module="PMDG_737NGX.dll"
1025296 Mouse by function: RX3d390*Xffcc,23 (flags=0090F554), Module="PMDG_737NGX.dll"
1025328 Mouse by function: RX3d390*Xffcc,23 (flags=0090F554), Module="PMDG_737NGX.dll"
1025359 Mouse by function: RX3d390*Xffcc,23 (flags=0090F554), Module="PMDG_737NGX.dll"
1025375 Mouse by function: RX3d390*Xffcc,23 (flags=0090F554), Module="PMDG_737NGX.dll"
1025406 Mouse by function: RX3d390*Xffcc,23 (flags=0090F554), Module="PMDG_737NGX.dll"
1025437 Mouse by function: RX3d390*Xffcc,23 (flags=0090F554), Module="PMDG_737NGX.dll"
1025468 Mouse by function: RX3d390*Xffcc,23 (flags=0090F554), Module="PMDG_737NGX.dll"
1025500 Mouse by function: RX3d390*Xffcc,23 (flags=0090F554), Module="PMDG_737NGX.dll"
1025515 Mouse by function: RX3d390*Xffcc,23 (flags=0090F554), Module="PMDG_737NGX.dll"
1025546 Mouse by function: RX3d390*Xffcc,23 (flags=0090F554), Module="PMDG_737NGX.dll"
1025578 Mouse by function: RX3d390*Xffcc,23 (flags=0090F554), Module="PMDG_737NGX.dll"
1025609 Mouse by function: RX3d390*Xffcc,23 (flags=0090F554), Module="PMDG_737NGX.dll"
1025625 Mouse by function: RX3d390*Xffcc,23 (flags=0090F554), Module="PMDG_737NGX.dll"
1025656 Mouse by function: RX3d390*Xffcc,23 (flags=0090F554), Module="PMDG_737NGX.dll"
1025687 Mouse by function: RX3d390*Xffcc,23 (flags=0090F554), Module="PMDG_737NGX.dll"
1025703 Mouse by function: RX3d390*Xffcc,23 (flags=0090F554), Module="PMDG_737NGX.dll"
1025734 Mouse by function: RX3d390*Xffcc,23 (flags=0090F554), Module="PMDG_737NGX.dll"
1025765 Mouse by function: RX3d390*Xffcc,23 (flags=0090F554), Module="PMDG_737NGX.dll"
1025796 Mouse by function: RX3d390*Xffcc,23 (flags=0090F554), Module="PMDG_737NGX.dll"
1025812 Mouse by function: RX3d390*Xffcc,23 (flags=0090F554), Module="PMDG_737NGX.dll"
1025843 Mouse by function: RX3d390*Xffcc,23 (flags=0090F554), Module="PMDG_737NGX.dll"
1025875 Mouse by function: RX3d390*Xffcc,23 (flags=0090F554), Module="PMDG_737NGX.dll"
1025906 Mouse by function: RX3d390*Xffcc,23 (flags=0090F554), Module="PMDG_737NGX.dll"
1025921 Mouse by function: RX3d390*Xffcc,23 (flags=0090F554), Module="PMDG_737NGX.dll"
1025953 Mouse by function: RX3d390*Xffcc,23 (flags=0090F554), Module="PMDG_737NGX.dll"
1025984 Mouse by function: RX3d390*Xffcc,23 (flags=0090F554), Module="PMDG_737NGX.dll"
1026015 Mouse by function: RX3d390*Xffcc,23 (flags=0090F554), Module="PMDG_737NGX.dll"
1026046 Mouse by function: RX3d390*Xffcc,23 (flags=0090F554), Module="PMDG_737NGX.dll"
1026062 Mouse by function: RX3d390*Xffcc,23 (flags=0090F554), Module="PMDG_737NGX.dll"
1026093 Mouse by function: RX3d390*Xffcc,23 (flags=0090F554), Module="PMDG_737NGX.dll"
1026125 Mouse by function: RX3d390*Xffcc,23 (flags=0090F554), Module="PMDG_737NGX.dll"
1026156 Mouse by function: RX3d390*Xffcc,23 (flags=0090F554), Module="PMDG_737NGX.dll"
1026187 Mouse by function: RX3d390*Xffcc,23 (flags=0090F554), Module="PMDG_737NGX.dll"
1026203 Mouse by function: RX3d390*Xffcc,23 (flags=0090F554), Module="PMDG_737NGX.dll"
1026250 Mouse by function: RX3d390*Xffcc,23 (flags=0090F554), Module="PMDG_737NGX.dll"
1031500 Mouse by function: RX3d390*Xffcc,23 (flags=0090F554), Module="PMDG_737NGX.dll"
1031531 Mouse by function: RX3d390*Xffcc,23 (flags=0090F554), Module="PMDG_737NGX.dll"
1031562 Mouse by function: RX3d390*Xffcc,23 (flags=0090F554), Module="PMDG_737NGX.dll"
1031578 Mouse by function: RX3d390*Xffcc,23 (flags=0090F554), Module="PMDG_737NGX.dll"
1031609 Mouse by function: RX3d390*Xffcc,23 (flags=0090F554), Module="PMDG_737NGX.dll"
1031640 Mouse by function: RX3d390*Xffcc,23 (flags=0090F554), Module="PMDG_737NGX.dll"
1031796 Mouse by function: RX3d390*Xffcc,23 (flags=0090F554), Module="PMDG_737NGX.dll"
1031828 Mouse by function: RX3d390*Xffcc,23 (flags=0090F554), Module="PMDG_737NGX.dll"
1031843 Mouse by function: RX3d390*Xffcc,23 (flags=0090F554), Module="PMDG_737NGX.dll"
1031875 Mouse by function: RX3d390*Xffcc,23 (flags=0090F554), Module="PMDG_737NGX.dll"
1031906 Mouse by function: RX3d390*Xffcc,23 (flags=0090F554), Module="PMDG_737NGX.dll"
1031937 Mouse by function: RX3d390*Xffcc,23 (flags=0090F554), Module="PMDG_737NGX.dll"
1031953 Mouse by function: RX3d390*Xffcc,23 (flags=0090F554), Module="PMDG_737NGX.dll"
1031984 Mouse by function: RX3d390*Xffcc,23 (flags=0090F554), Module="PMDG_737NGX.dll"
1032015 Mouse by function: RX3d390*Xffcc,23 (flags=0090F554), Module="PMDG_737NGX.dll"
1032046 Mouse by function: RX3d390*Xffcc,23 (flags=0090F554), Module="PMDG_737NGX.dll"
1032078 Mouse by function: RX3d390*Xffcc,23 (flags=0090F554), Module="PMDG_737NGX.dll"
1032109 Mouse by function: RX3d390*Xffcc,23 (flags=0090F554), Module="PMDG_737NGX.dll"
1032140 Mouse by function: RX3d390*Xffcc,23 (flags=0090F554), Module="PMDG_737NGX.dll"
1032156 Mouse by function: RX3d390*Xffcc,23 (flags=0090F554), Module="PMDG_737NGX.dll"
1032187 Mouse by function: RX3d390*Xffcc,23 (flags=0090F554), Module="PMDG_737NGX.dll"
1032218 Mouse by function: RX3d390*Xffcc,23 (flags=0090F554), Module="PMDG_737NGX.dll"
1032250 Mouse by function: RX3d390*Xffcc,23 (flags=0090F554), Module="PMDG_737NGX.dll"
1032265 Mouse by function: RX3d390*Xffcc,23 (flags=0090F554), Module="PMDG_737NGX.dll"
1032296 Mouse by function: RX3d390*Xffcc,23 (flags=0090F554), Module="PMDG_737NGX.dll"
1032328 Mouse by function: RX3d390*Xffcc,23 (flags=0090F554), Module="PMDG_737NGX.dll"
1032343 Mouse by function: RX3d390*Xffcc,23 (flags=0090F554), Module="PMDG_737NGX.dll"
1032375 Mouse by function: RX3d390*Xffcc,23 (flags=0090F554), Module="PMDG_737NGX.dll"
1032406 Mouse by function: RX3d390*Xffcc,23 (flags=0090F554), Module="PMDG_737NGX.dll"
1032437 Mouse by function: RX3d390*Xffcc,23 (flags=0090F554), Module="PMDG_737NGX.dll"
1032468 Mouse by function: RX3d390*Xffcc,23 (flags=0090F554), Module="PMDG_737NGX.dll"
1032500 Mouse by function: RX3d390*Xffcc,23 (flags=0090F554), Module="PMDG_737NGX.dll"
1032531 Mouse by function: RX3d390*Xffcc,23 (flags=0090F554), Module="PMDG_737NGX.dll"
1032562 Mouse by function: RX3d390*Xffcc,23 (flags=0090F554), Module="PMDG_737NGX.dll"
1032593 Mouse by function: RX3d390*Xffcc,23 (flags=0090F554), Module="PMDG_737NGX.dll"
1032625 Mouse by function: RX3d390*Xffcc,23 (flags=0090F554), Module="PMDG_737NGX.dll"
1032656 Mouse by function: RX3d390*Xffcc,23 (flags=0090F554), Module="PMDG_737NGX.dll"
1032687 Mouse by function: RX3d390*Xffcc,23 (flags=0090F554), Module="PMDG_737NGX.dll"
1032718 Mouse by function: RX3d390*Xffcc,23 (flags=0090F554), Module="PMDG_737NGX.dll"
1032750 Mouse by function: RX3d390*Xffcc,23 (flags=0090F554), Module="PMDG_737NGX.dll"
1032765 Mouse by function: RX3d390*Xffcc,23 (flags=0090F554), Module="PMDG_737NGX.dll"
1032796 Mouse by function: RX3d390*Xffcc,23 (flags=0090F554), Module="PMDG_737NGX.dll"
1032828 Mouse by function: RX3d390*Xffcc,23 (flags=0090F554), Module="PMDG_737NGX.dll"
1032859 Mouse by function: RX3d390*Xffcc,23 (flags=0090F554), Module="PMDG_737NGX.dll"
1032890 Mouse by function: RX3d390*Xffcc,23 (flags=0090F554), Module="PMDG_737NGX.dll"
1032921 Mouse by function: RX3d390*Xffcc,23 (flags=0090F554), Module="PMDG_737NGX.dll"
1032953 Mouse by function: RX3d390*Xffcc,23 (flags=0090F554), Module="PMDG_737NGX.dll"
1032984 Mouse by function: RX3d390*Xffcc,23 (flags=0090F554), Module="PMDG_737NGX.dll"
1033015 Mouse by function: RX3d390*Xffcc,23 (flags=0090F554), Module="PMDG_737NGX.dll"
1033046 Mouse by function: RX3d390*Xffcc,23 (flags=0090F554), Module="PMDG_737NGX.dll"
1033078 Mouse by function: RX3d390*Xffcc,23 (flags=0090F554), Module="PMDG_737NGX.dll"
1033093 Mouse by function: RX3d390*Xffcc,23 (flags=0090F554), Module="PMDG_737NGX.dll"
1033125 Mouse by function: RX3d390*Xffcc,23 (flags=0090F554), Module="PMDG_737NGX.dll"
1033156 Mouse by function: RX3d390*Xffcc,23 (flags=0090F554), Module="PMDG_737NGX.dll"
1033187 Mouse by function: RX3d390*Xffcc,23 (flags=0090F554), Module="PMDG_737NGX.dll"
1033203 Mouse by function: RX3d390*Xffcc,23 (flags=0090F554), Module="PMDG_737NGX.dll"
1033234 Mouse by function: RX3d390*Xffcc,23 (flags=0090F554), Module="PMDG_737NGX.dll"
1033265 Mouse by function: RX3d390*Xffcc,23 (flags=0090F554), Module="PMDG_737NGX.dll"
1033296 Mouse by function: RX3d390*Xffcc,23 (flags=0090F554), Module="PMDG_737NGX.dll"
1033328 Mouse by function: RX3d390*Xffcc,23 (flags=0090F554), Module="PMDG_737NGX.dll"
1033359 Mouse by function: RX3d390*Xffcc,23 (flags=0090F554), Module="PMDG_737NGX.dll"
1033390 Mouse by function: RX3d390*Xffcc,23 (flags=0090F554), Module="PMDG_737NGX.dll"
1033421 Mouse by function: RX3d390*Xffcc,23 (flags=0090F554), Module="PMDG_737NGX.dll"
1033453 Mouse by function: RX3d390*Xffcc,23 (flags=0090F554), Module="PMDG_737NGX.dll"
1033484 Mouse by function: RX3d390*Xffcc,23 (flags=0090F554), Module="PMDG_737NGX.dll"
1033515 Mouse by function: RX3d390*Xffcc,23 (flags=0090F554), Module="PMDG_737NGX.dll"
1033546 Mouse by function: RX3d390*Xffcc,23 (flags=0090F554), Module="PMDG_737NGX.dll"
1033578 Mouse by function: RX3d390*Xffcc,23 (flags=0090F554), Module="PMDG_737NGX.dll"
1033609 Mouse by function: RX3d390*Xffcc,23 (flags=0090F554), Module="PMDG_737NGX.dll"
1033640 Mouse by function: RX3d390*Xffcc,23 (flags=0090F554), Module="PMDG_737NGX.dll"
1033671 Mouse by function: RX3d390*Xffcc,23 (flags=0090F554), Module="PMDG_737NGX.dll"
1033703 Mouse by function: RX3d390*Xffcc,23 (flags=0090F554), Module="PMDG_737NGX.dll"
1033734 Mouse by function: RX3d390*Xffcc,23 (flags=0090F554), Module="PMDG_737NGX.dll"
1033765 Mouse by function: RX3d390*Xffcc,23 (flags=0090F554), Module="PMDG_737NGX.dll"
1033796 Mouse by function: RX3d390*Xffcc,23 (flags=0090F554), Module="PMDG_737NGX.dll"
1033828 Mouse by function: RX3d390*Xffcc,23 (flags=0090F554), Module="PMDG_737NGX.dll"
1033859 Mouse by function: RX3d390*Xffcc,23 (flags=0090F554), Module="PMDG_737NGX.dll"
1033890 Mouse by function: RX3d390*Xffcc,23 (flags=0090F554), Module="PMDG_737NGX.dll"
1033937 Mouse by function: RX3d390*Xffcc,23 (flags=0090F554), Module="PMDG_737NGX.dll"
1033968 Mouse by function: RX3d390*Xffcc,23 (flags=0090F554), Module="PMDG_737NGX.dll"
1034000 Mouse by function: RX3d390*Xffcc,23 (flags=0090F554), Module="PMDG_737NGX.dll"
1034031 Mouse by function: RX3d390*Xffcc,23 (flags=0090F554), Module="PMDG_737NGX.dll"
1034062 Mouse by function: RX3d390*Xffcc,23 (flags=0090F554), Module="PMDG_737NGX.dll"
1034093 Mouse by function: RX3d390*Xffcc,23 (flags=0090F554), Module="PMDG_737NGX.dll"
1034125 Mouse by function: RX3d390*Xffcc,23 (flags=0090F554), Module="PMDG_737NGX.dll"
1034156 Mouse by function: RX3d390*Xffcc,23 (flags=0090F554), Module="PMDG_737NGX.dll"
1034187 Mouse by function: RX3d390*Xffcc,23 (flags=0090F554), Module="PMDG_737NGX.dll"
1034218 Mouse by function: RX3d390*Xffcc,23 (flags=0090F554), Module="PMDG_737NGX.dll"
1034250 Mouse by function: RX3d390*Xffcc,23 (flags=0090F554), Module="PMDG_737NGX.dll"
1034281 Mouse by function: RX3d390*Xffcc,23 (flags=0090F554), Module="PMDG_737NGX.dll"
1034312 Mouse by function: RX3d390*Xffcc,23 (flags=0090F554), Module="PMDG_737NGX.dll"
1034343 Mouse by function: RX3d390*Xffcc,23 (flags=0090F554), Module="PMDG_737NGX.dll"
1034375 Mouse by function: RX3d390*Xffcc,23 (flags=0090F554), Module="PMDG_737NGX.dll"
1034406 Mouse by function: RX3d390*Xffcc,23 (flags=0090F554), Module="PMDG_737NGX.dll"
1034437 Mouse by function: RX3d390*Xffcc,23 (flags=0090F554), Module="PMDG_737NGX.dll"
1034468 Mouse by function: RX3d390*Xffcc,23 (flags=0090F554), Module="PMDG_737NGX.dll"
1034609 Mouse by function: RX3d320*Xffcc,23 (flags=0090F554), Module="PMDG_737NGX.dll"
1034640 Mouse by function: RX3d320*Xffcc,23 (flags=0090F554), Module="PMDG_737NGX.dll"
1034687 Mouse by function: RX3d320*Xffcc,23 (flags=0090F554), Module="PMDG_737NGX.dll"
1034718 Mouse by function: RX3d320*Xffcc,23 (flags=0090F554), Module="PMDG_737NGX.dll"
1034765 Mouse by function: RX3d320*Xffcc,23 (flags=0090F554), Module="PMDG_737NGX.dll"
1034796 Mouse by function: RX3d320*Xffcc,23 (flags=0090F554), Module="PMDG_737NGX.dll"
1034828 Mouse by function: RX3d320*Xffcc,23 (flags=0090F554), Module="PMDG_737NGX.dll"
1034875 Mouse by function: RX3d390*Xffcc,23 (flags=0090F554), Module="PMDG_737NGX.dll"
1034906 Mouse by function: RX3d390*Xffcc,23 (flags=0090F554), Module="PMDG_737NGX.dll"
1034921 Mouse by function: RX3d390*Xffcc,23 (flags=0090F554), Module="PMDG_737NGX.dll"
1034953 Mouse by function: RX3d390*Xffcc,23 (flags=0090F554), Module="PMDG_737NGX.dll"
1034984 Mouse by function: RX3d390*Xffcc,23 (flags=0090F554), Module="PMDG_737NGX.dll"
1035000 Mouse by function: RX3d390*Xffcc,23 (flags=0090F554), Module="PMDG_737NGX.dll"
1035031 Mouse by function: RX3d390*Xffcc,23 (flags=0090F554), Module="PMDG_737NGX.dll"
1035062 Mouse by function: RX3d390*Xffcc,23 (flags=0090F554), Module="PMDG_737NGX.dll"
1035093 Mouse by function: RX3d390*Xffcc,23 (flags=0090F554), Module="PMDG_737NGX.dll"
1035125 Mouse by function: RX3d390*Xffcc,23 (flags=0090F554), Module="PMDG_737NGX.dll"
1035156 Mouse by function: RX3d390*Xffcc,23 (flags=0090F554), Module="PMDG_737NGX.dll"
1035187 Mouse by function: RX3d390*Xffcc,23 (flags=0090F554), Module="PMDG_737NGX.dll"
1035218 Mouse by function: RX3d390*Xffcc,23 (flags=0090F554), Module="PMDG_737NGX.dll"
1035250 Mouse by function: RX3d390*Xffcc,23 (flags=0090F554), Module="PMDG_737NGX.dll"
1035281 Mouse by function: RX3d390*Xffcc,23 (flags=0090F554), Module="PMDG_737NGX.dll"
1035312 Mouse by function: RX3d390*Xffcc,23 (flags=0090F554), Module="PMDG_737NGX.dll"
1035343 Mouse by function: RX3d390*Xffcc,23 (flags=0090F554), Module="PMDG_737NGX.dll"
1035375 Mouse by function: RX3d390*Xffcc,23 (flags=0090F554), Module="PMDG_737NGX.dll"
1035406 Mouse by function: RX3d390*Xffcc,23 (flags=0090F554), Module="PMDG_737NGX.dll"
1035453 Mouse by function: RX3d390*Xffcc,23 (flags=0090F554), Module="PMDG_737NGX.dll"
1035500 Mouse by function: RX3d520*Xffcc,23 (flags=0090F554), Module="PMDG_737NGX.dll"
1035859 Mouse by function: RX3d520*Xffcc,23 (flags=0090F554), Module="PMDG_737NGX.dll"
1035890 Mouse by function: RX3d520*Xffcc,23 (flags=0090F554), Module="PMDG_737NGX.dll"
1036093 Mouse by function: RX3d390*Xffcc,23 (flags=0090F554), Module="PMDG_737NGX.dll"
1036125 Mouse by function: RX3d390*Xffcc,23 (flags=0090F554), Module="PMDG_737NGX.dll"
1036156 Mouse by function: RX3d390*Xffcc,23 (flags=0090F554), Module="PMDG_737NGX.dll"
1036187 Mouse by function: RX3d390*Xffcc,23 (flags=0090F554), Module="PMDG_737NGX.dll"
1036234 Mouse by function: RX3d390*Xffcc,23 (flags=0090F554), Module="PMDG_737NGX.dll"
1036265 Mouse by function: RX3d390*Xffcc,23 (flags=0090F554), Module="PMDG_737NGX.dll"
1036281 Mouse by function: RX3d390*Xffcc,23 (flags=0090F554), Module="PMDG_737NGX.dll"
1036312 Mouse by function: RX3d390*Xffcc,23 (flags=0090F554), Module="PMDG_737NGX.dll"
1036343 Mouse by function: RX3d390*Xffcc,23 (flags=0090F554), Module="PMDG_737NGX.dll"
1036375 Mouse by function: RX3d390*Xffcc,23 (flags=0090F554), Module="PMDG_737NGX.dll"
1036406 Mouse by function: RX3d390*Xffcc,23 (flags=0090F554), Module="PMDG_737NGX.dll"
1036437 Mouse by function: RX3d390*Xffcc,23 (flags=0090F554), Module="PMDG_737NGX.dll"
1036609 Mouse by function: RX3d320*Xffcc,23 (flags=0090F554), Module="PMDG_737NGX.dll"
1036640 Mouse by function: RX3d320*Xffcc,23 (flags=0090F554), Module="PMDG_737NGX.dll"
1036671 Mouse by function: RX3d320*Xffcc,23 (flags=0090F554), Module="PMDG_737NGX.dll"
1036703 Mouse by function: RX3d320*Xffcc,23 (flags=0090F554), Module="PMDG_737NGX.dll"
1036734 Mouse by function: RX3d320*Xffcc,23 (flags=0090F554), Module="PMDG_737NGX.dll"
1036765 Mouse by function: RX3d320*Xffcc,23 (flags=0090F554), Module="PMDG_737NGX.dll"
1036796 Mouse by function: RX3d320*Xffcc,23 (flags=0090F554), Module="PMDG_737NGX.dll"
1036812 Mouse by function: RX3d320*Xffcc,23 (flags=0090F554), Module="PMDG_737NGX.dll"
1036843 Mouse by function: RX3d320*Xffcc,23 (flags=0090F554), Module="PMDG_737NGX.dll"
1036875 Mouse by function: RX3d320*Xffcc,23 (flags=0090F554), Module="PMDG_737NGX.dll"
1036906 Mouse by function: RX3d320*Xffcc,23 (flags=0090F554), Module="PMDG_737NGX.dll"
1036937 Mouse by function: RX3d320*Xffcc,23 (flags=0090F554), Module="PMDG_737NGX.dll"
1037140 Mouse by function: RX3d390*Xffcc,23 (flags=0090F554), Module="PMDG_737NGX.dll"
1037156 Mouse by function: RX3d390*Xffcc,23 (flags=0090F554), Module="PMDG_737NGX.dll"
1037203 Mouse by function: RX3d390*Xffcc,23 (flags=0090F554), Module="PMDG_737NGX.dll"
1037234 Mouse by function: RX3d390*Xffcc,23 (flags=0090F554), Module="PMDG_737NGX.dll"
1037265 Mouse by function: RX3d390*Xffcc,23 (flags=0090F554), Module="PMDG_737NGX.dll"
1037296 Mouse by function: RX3d390*Xffcc,23 (flags=0090F554), Module="PMDG_737NGX.dll"
1037328 Mouse by function: RX3d390*Xffcc,23 (flags=0090F554), Module="PMDG_737NGX.dll"
1037359 Mouse by function: RX3d390*Xffcc,23 (flags=0090F554), Module="PMDG_737NGX.dll"
1037390 Mouse by function: RX3d390*Xffcc,23 (flags=0090F554), Module="PMDG_737NGX.dll"
1037406 Mouse by function: RX3d390*Xffcc,23 (flags=0090F554), Module="PMDG_737NGX.dll"
1037437 Mouse by function: RX3d390*Xffcc,23 (flags=0090F554), Module="PMDG_737NGX.dll"
1037468 Mouse by function: RX3d390*Xffcc,23 (flags=0090F554), Module="PMDG_737NGX.dll"
1037500 Mouse by function: RX3d390*Xffcc,23 (flags=0090F554), Module="PMDG_737NGX.dll"
1037531 Mouse by function: RX3d390*Xffcc,23 (flags=0090F554), Module="PMDG_737NGX.dll"
1037562 Mouse by function: RX3d390*Xffcc,23 (flags=0090F554), Module="PMDG_737NGX.dll"
1037578 Mouse by function: RX3d390*Xffcc,23 (flags=0090F554), Module="PMDG_737NGX.dll"
1037609 Mouse by function: RX3d390*Xffcc,23 (flags=0090F554), Module="PMDG_737NGX.dll"
1037640 Mouse by function: RX3d390*Xffcc,23 (flags=0090F554), Module="PMDG_737NGX.dll"
1037671 Mouse by function: RX3d390*Xffcc,23 (flags=0090F554), Module="PMDG_737NGX.dll"
1037703 Mouse by function: RX3d390*Xffcc,23 (flags=0090F554), Module="PMDG_737NGX.dll"
1037750 Mouse by function: RX3d390*Xffcc,23 (flags=0090F554), Module="PMDG_737NGX.dll"
1038406 Mouse by function: RX3d390*Xffcc,23 (flags=0090F554), Module="PMDG_737NGX.dll"
1038421 Mouse by function: RX3d390*Xffcc,23 (flags=0090F554), Module="PMDG_737NGX.dll"
1038453 Mouse by function: RX3d390*Xffcc,23 (flags=0090F554), Module="PMDG_737NGX.dll"
1038484 Mouse by function: RX3d390*Xffcc,23 (flags=0090F554), Module="PMDG_737NGX.dll"
1038515 Mouse by function: RX3d390*Xffcc,23 (flags=0090F554), Module="PMDG_737NGX.dll"
1038546 Mouse by function: RX3d390*Xffcc,23 (flags=0090F554), Module="PMDG_737NGX.dll"
1038562 Mouse by function: RX3d390*Xffcc,23 (flags=0090F554), Module="PMDG_737NGX.dll"
1038578 Mouse by function: RX3d390*Xffcc,23 (flags=0090F554), Module="PMDG_737NGX.dll"
1038609 Mouse by function: RX3d390*Xffcc,23 (flags=0090F554), Module="PMDG_737NGX.dll"
1038625 Mouse by function: RX3d390*Xffcc,23 (flags=0090F554), Module="PMDG_737NGX.dll"
1038671 Mouse by function: RX3d390*Xffcc,23 (flags=0090F554), Module="PMDG_737NGX.dll"
1038687 Mouse by function: RX3d390*Xffcc,23 (flags=0090F554), Module="PMDG_737NGX.dll"
1038734 Mouse by function: RX3d390*Xffcc,23 (flags=0090F554), Module="PMDG_737NGX.dll"
1039687 Mouse by function: RX3d390*Xffcc,23 (flags=0090F554), Module="PMDG_737NGX.dll"
1039718 Mouse by function: RX3d390*Xffcc,23 (flags=0090F554), Module="PMDG_737NGX.dll"
1039750 Mouse by function: RX3d390*Xffcc,23 (flags=0090F554), Module="PMDG_737NGX.dll"
1039765 Mouse by function: RX3d390*Xffcc,23 (flags=0090F554), Module="PMDG_737NGX.dll"
1039796 Mouse by function: RX3d390*Xffcc,23 (flags=0090F554), Module="PMDG_737NGX.dll"
1039828 Mouse by function: RX3d390*Xffcc,23 (flags=0090F554), Module="PMDG_737NGX.dll"
1039859 Mouse by function: RX3d390*Xffcc,23 (flags=0090F554), Module="PMDG_737NGX.dll"
1039890 Mouse by function: RX3d390*Xffcc,23 (flags=0090F554), Module="PMDG_737NGX.dll"
1039906 Mouse by function: RX3d390*Xffcc,23 (flags=0090F554), Module="PMDG_737NGX.dll"
1039937 Mouse by function: RX3d390*Xffcc,23 (flags=0090F554), Module="PMDG_737NGX.dll"
1039968 Mouse by function: RX3d390*Xffcc,23 (flags=0090F554), Module="PMDG_737NGX.dll"
1040000 Mouse by function: RX3d390*Xffcc,23 (flags=0090F554), Module="PMDG_737NGX.dll"
1040046 Mouse by function: RX3d390*Xffcc,23 (flags=0090F554), Module="PMDG_737NGX.dll"
1040093 Mouse by function: RX3e6f0*Xffcc,23 (flags=0090F554), Module="PMDG_737NGX.dll"
1040125 Mouse by function: RX3e6f0*Xffcc,23 (flags=0090F554), Module="PMDG_737NGX.dll"
1040156 Mouse by function: RX3e6f0*Xffcc,23 (flags=0090F554), Module="PMDG_737NGX.dll"
1040187 Mouse by function: RX3e6f0*Xffcc,23 (flags=0090F554), Module="PMDG_737NGX.dll"
1040203 Mouse by function: RX3e6f0*Xffcc,23 (flags=0090F554), Module="PMDG_737NGX.dll"
1040234 Mouse by function: RX3e6f0*Xffcc,23 (flags=0090F554), Module="PMDG_737NGX.dll"
1040265 Mouse by function: RX3e6f0*Xffcc,23 (flags=0090F554), Module="PMDG_737NGX.dll"
1040296 Mouse by function: RX3e6f0*Xffcc,23 (flags=0090F554), Module="PMDG_737NGX.dll"
1040312 Mouse by function: RX3e6f0*Xffcc,23 (flags=0090F554), Module="PMDG_737NGX.dll"
1040359 Mouse by function: RX3e6f0*Xffcc,23 (flags=0090F554), Module="PMDG_737NGX.dll"
1040390 Mouse by function: RX3e6f0*Xffcc,23 (flags=0090F554), Module="PMDG_737NGX.dll"
1041359 Mouse by function: RX3d390*Xffcc,23 (flags=0090F554), Module="PMDG_737NGX.dll"
1041390 Mouse by function: RX3d390*Xffcc,23 (flags=0090F554), Module="PMDG_737NGX.dll"
1041421 Mouse by function: RX3d390*Xffcc,23 (flags=0090F554), Module="PMDG_737NGX.dll"
1046796 Mouse by function: RX3d520*Xffcc,23 (flags=0090F554), Module="PMDG_737NGX.dll"
1046828 Mouse by function: RX3d520*Xffcc,23 (flags=0090F554), Module="PMDG_737NGX.dll"
1046859 Mouse by function: RX3d520*Xffcc,23 (flags=0090F554), Module="PMDG_737NGX.dll"
1046890 Mouse by function: RX3d520*Xffcc,23 (flags=0090F554), Module="PMDG_737NGX.dll"
1046921 Mouse by function: RX3d520*Xffcc,23 (flags=0090F554), Module="PMDG_737NGX.dll"
1047000 Mouse by function: RX3d520*Xffcc,23 (flags=0090F554), Module="PMDG_737NGX.dll"
1047031 Mouse by function: RX3d520*Xffcc,23 (flags=0090F554), Module="PMDG_737NGX.dll"
1049843 Mouse by function: RX3d520*Xffcc,23 (flags=0090F554), Module="PMDG_737NGX.dll"
1049875 Mouse by function: RX3d520*Xffcc,23 (flags=0090F554), Module="PMDG_737NGX.dll"
1055312 Mouse by function: RX3e9f0*Xffcc,23 (flags=0090F554), Module="PMDG_737NGX.dll"
1055343 Mouse by function: RX3e9f0*Xffcc,23 (flags=0090F554), Module="PMDG_737NGX.dll"
1055375 Mouse by function: RX3e9f0*Xffcc,23 (flags=0090F554), Module="PMDG_737NGX.dll"
1055390 Mouse by function: RX3e9f0*Xffcc,23 (flags=0090F554), Module="PMDG_737NGX.dll"
1055421 Mouse by function: RX3e9f0*Xffcc,23 (flags=0090F554), Module="PMDG_737NGX.dll"
1055453 Mouse by function: RX3e9f0*Xffcc,23 (flags=0090F554), Module="PMDG_737NGX.dll"
1055484 Mouse by function: RX3e9f0*Xffcc,23 (flags=0090F554), Module="PMDG_737NGX.dll"
1055515 Mouse by function: RX3e9f0*Xffcc,23 (flags=0090F554), Module="PMDG_737NGX.dll"
1055562 Mouse by function: RX3e9f0*Xffcc,23 (flags=0090F554), Module="PMDG_737NGX.dll"
1055640 Mouse by function: RX406c0*Xffcc,23 (flags=0090F554), Module="PMDG_737NGX.dll"
1055671 Mouse by function: RX40840*Xffcc,23 (flags=0090F554), Module="PMDG_737NGX.dll"
1055703 Mouse by function: RX40840*Xffcc,23 (flags=0090F554), Module="PMDG_737NGX.dll"
1055734 Mouse by function: RX40840*Xffcc,23 (flags=0090F554), Module="PMDG_737NGX.dll"
1055765 Mouse by function: RX40840*Xffcc,23 (flags=0090F554), Module="PMDG_737NGX.dll"
1055781 Mouse by function: RX40840*Xffcc,23 (flags=0090F554), Module="PMDG_737NGX.dll"
1055828 Mouse by function: RX40840*Xffcc,23 (flags=0090F554), Module="PMDG_737NGX.dll"
1055859 Mouse by function: RX40840*Xffcc,23 (flags=0090F554), Module="PMDG_737NGX.dll"
1055875 Mouse by function: RX40840*Xffcc,23 (flags=0090F554), Module="PMDG_737NGX.dll"
1055906 Mouse by function: RX40840*Xffcc,23 (flags=0090F554), Module="PMDG_737NGX.dll"
1058265 Mouse by function: RX38070*Xffcc,23 (flags=0090F554), Module="PMDG_737NGX.dll"
1058281 Mouse by function: RX38070*Xffcc,23 (flags=0090F554), Module="PMDG_737NGX.dll"
1058312 Mouse by function: RX38070*Xffcc,23 (flags=0090F554), Module="PMDG_737NGX.dll"
1058343 Mouse by function: RX38070*Xffcc,23 (flags=0090F554), Module="PMDG_737NGX.dll"
1058390 Mouse by function: RX38070*Xffcc,23 (flags=0090F554), Module="PMDG_737NGX.dll"
1059250 Mouse by function: RX3e9f0*Xffcc,23 (flags=0090F554), Module="PMDG_737NGX.dll"
1059281 Mouse by function: RX3e9f0*Xffcc,23 (flags=0090F554), Module="PMDG_737NGX.dll"
1059312 Mouse by function: RX3e9f0*Xffcc,23 (flags=0090F554), Module="PMDG_737NGX.dll"
1059343 Mouse by function: RX3e9f0*Xffcc,23 (flags=0090F554), Module="PMDG_737NGX.dll"
1059875 Mouse by function: RX3d520*Xffcc,23 (flags=0090F554), Module="PMDG_737NGX.dll"
1059906 Mouse by function: RX3d390*Xffcc,23 (flags=0090F554), Module="PMDG_737NGX.dll"
that is the log file. What can i do to make fsuipc mouse macro making work? On the contrary! It is clearly shown in your picture. The FSUIPC file with the hidden filetype (so you have NOT changed that Windows Explorer option! ), and description in your language saying it is a text documnet. The other one with the missing type and clearly described as the configuration settings is the INI. Both exactly as I said to you. Why post a picture of a screen you evidently didn't actually look at? You haven't told me what you are doing afterwards! I did ask. And why are you ignoring my advice to use the PMDG controls? That ewould be a far easier and more reliable method. that's why PMDG provided them, so why ignore them? Ok I’ll try thanks, I wasn’t ignoring but I wi try at least. But I sent you the log file? What do you mean? 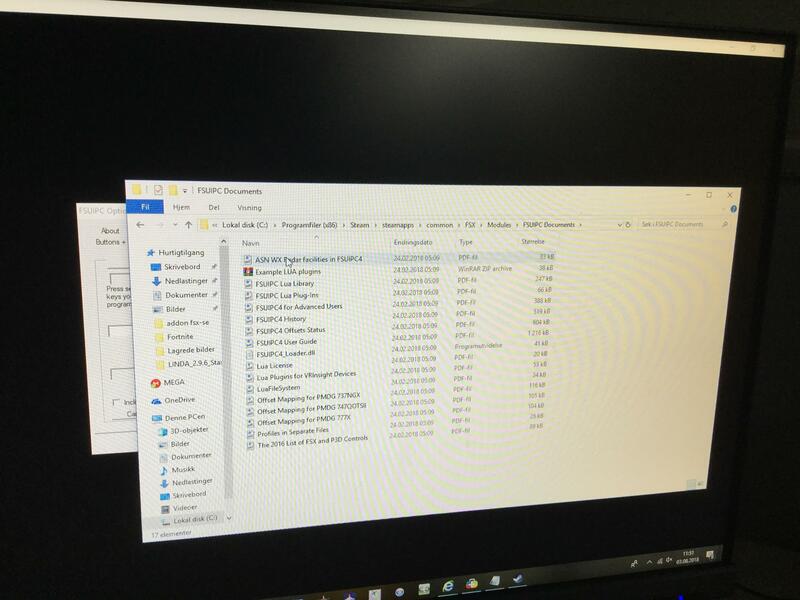 I clicked on fsuipc4.log and I got the log file that I showed you, but can you help me with changing the log file so I can configure it to work with pmdg? Again, as everytime before, you are not explaining what you are doing. just saying "set the letter q to taxi light", what are you actually assigning to. How? I cannot help you if you persist in not actually saying exactly what you are doing! I'm out now till later tomorrow. Why don't you ask in the PMDG forums, or doing your own searches as I suggested, for instance in the User Contributions above? I have spent a lot of time trying to explain things to you and asking you to be more exact, all to no avail! I’m sorry but my english is not that good, so it is hard to explain. You said this in the other post, but you didn’t give me a solution! You just said this, I know that I am not using p3d4, I am using fsxse but I can’t buy prepar3d just to make fsuipc work! Also, you told me that the gauge thinks it is being clicked, but you didn’t tell me a fix for that either. So if you just tell me what I can do to make mouse macros work, maybe I can use the premade ones. But I have still used 24 euros on this and if it then doesnt work... So please, just tell me what I can do to fix this when you get back so I don’t have to bother anymore. I understand that I may have explained thing badly, but if you can point out what information you want, then it’s easier for me to explain! I’m sorry if I am using up all your time but it’s no other alternatives. I click key presses, create mouse macro, and ok. When I hover over a button or switch, in this case: taxilight, it just flashes white and red. I can click the switch but the flashing doesn’t stop. I can’t type in a name of the function or anything, I have tried every switch like I said, but it still happens. I have also tried clicking and moving my mouse away right after, but when I then click tab. Nothing happens, no switch turns on or anything. If this has something to do with the log file, I have it right now in front of me, but I am ready tomorrow to. If you can tell me what I can change in the log file to make this work, I will do that and maybe the problem gets solved. Or you can tell me what I can do if it has nothing to do with the log file. I understand that you are getting stressed out or tired, but I am to. I have just used 80 euros on something that doesn’t even work because Linda doesn’t work, and, I have used 24 euros on fsuipc and that doesn’t work either! I will try doing some research even though almost nobody posts this information. Of all the costumers you have, has nobody of those had the same problem that I have? I doubt it. Of all the costumers you have, has nobody of those had the same problem that I have? I doubt it. Most take advice. Why not you? USE THE PMDG CONTROLS. That is what they are for! Mouse macros are not the best solution in every case. In fact their use in FSX and later is very limited, and they work infrequently due to the way add-on aircraft are made these days. They were great in FS2002 and FS2004, and will still work for the same old aircraft they worked in back then. They do work on a lot of the switches in the PMDG aircraft, but i can't tell you which. And they are not needed for an aircraft which is supplied with a full complement of assignable controls in any case. So why not read what i keep telling you, and take that route? my 80 euros I used on the switch panel btw. Okay I understand now, mouse macros isn’t working, that is okay. But Pmdg premade functions doesn’t seem to work either. But like I said, do you know how to connect to Linda? Thanks. The mouse macro you created may well work, but as you NEVER told me exactly what you then did, despite me asking several times, I've given up. I Just do not understand why you are so secretive about it! And now it is the same with the PMDG supplied controls. So you obviously have no idea of what are doing and since you don't explain yourself at all, I've really no way of helping, have I?